What those consequences would be isn’t clear. The partnership agreements refer vaguely to the option to “consolidate or otherwise reconfigure” schools that don’t turn things around. But most observers suspect that schools like Bethune face shuttering if things don’t improve. Woods and her staff could be fired. And her students could face yet another disruption to lives that, in many cases, have already been rocked by violence, homelessness and other trials of poverty. All of Woods’ students — 100 percent — are from families whose incomes are at or below the federal poverty level, she said. 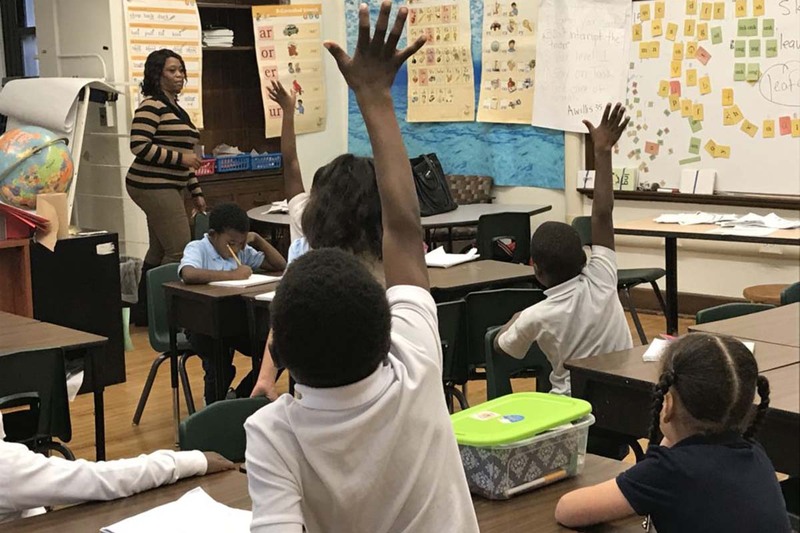 So when Woods visited that sixth-grade classroom — taught by Samantha Vann, asecond-year teacher who started at Bethune in September — she was looking for any possible way to maximize learning. "But Woods was not a casual observer. And simply having a classroom run smoothly wasn’t going to cut it at this school — not any more. EXACTLY how does a student that isn't performing at grade level get advanced to the next level? I wish her well, but 2 out of 348 passed the M-STEP ELA and math last year. What was going on at this school before she got there and who was responsible for defrauding these students? I applaud all teachers and administrators that try to find ways to educate children and to get them interested in skills that will get them jobs or college, etc. I do not have the answers because inner cities have struggled with this for too many decades. We are seeing the result of generations of Comfortable Poverty and schools becoming more childcare centers rather than learning centers. Fact remains, that ~70% Sixth Grade Girl in Detroit Public Schools will have a baby by the age of 23 without a father and the vast majority will live in poverty. Very few break the cycle. where did Mark get his statistics from? Why go as high as 23 years of age, thats a long way from high school. What are the same percentages for white girls, Asian girls, native American girls, and lastly wealthy girls..
2012 Data for Age of Mother at Births 2012 data. 41% of Black Births were to Women Age 24 or younger. 18% of White Births were to Women Age 24 or younger. Please call them students, never "babies". That could go a long way. Also, adopt GRIT type programs that teach perseverance! Good luck, bless you all!